All transactions are safe and secure with a reliable history in online purchasing behind each of our associates. 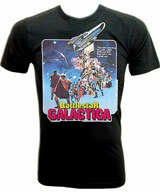 Buy the Vintage Battlestar Galactica t-shirts to own Battlestar Galactica clothing and merchandise. Here, you will find a rare selection of vintage Battlestar Galactica shirts. Each BSG tee is just as retro as the original 1978 series. The iron-on transfers feature many of the memorable characters from the original show, as well as poster and promo art. Die-hard fans will truly appreciate these vintage designs, which conjure up memories of the classic Battlestar Galactica TV series, one that found the former inhabitants of the Twelve Colonies searching for a star called earth. In addition to the Vintage Battlestar Galactica tees above, browse the Battlestar Galactica Clothing Gallery for more apparel like men's and women's clothes, kids shirts or hoodies.